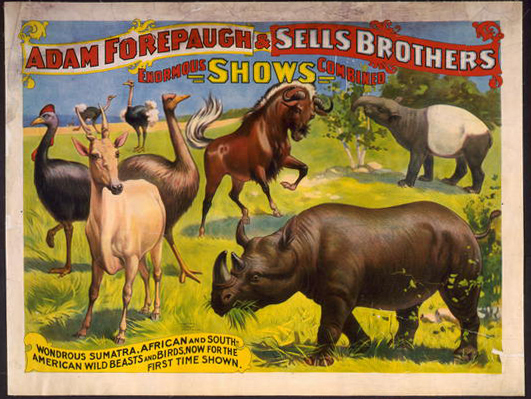 Title: Forepaugh & Sells Brothers shows combined / / The Strobridge Litho. Co., Cincinnati & New York. Medium: 1 print (poster) : chromolithograph ; 46 x 33 cm. 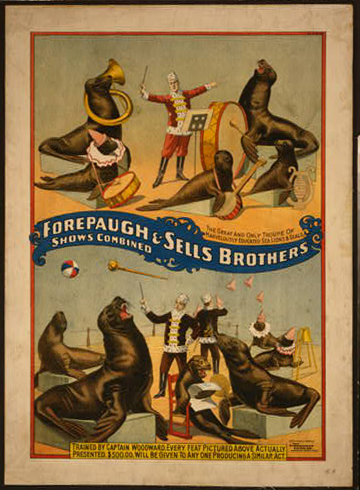 Summary: Circus poster showing performing sea lions and seals. Rights Advisory: No known restrictions on publication. No renewal in Copyright office. Copyright by The Strobridge Litho. Co..
Caption: Trained by Captain Woodward. Every feat pictured above actually presented. $500.00 will be given to anyone producing a similar act. Title: Gentry Bros. circus Miss Louise Hilton, the greatest rider the world has ever known / / National Ptg & Eng. Co., Chicago, New York & St. Louis. Medium: 1 print (poster) : chromolithograph ; 105 x 72 cm. 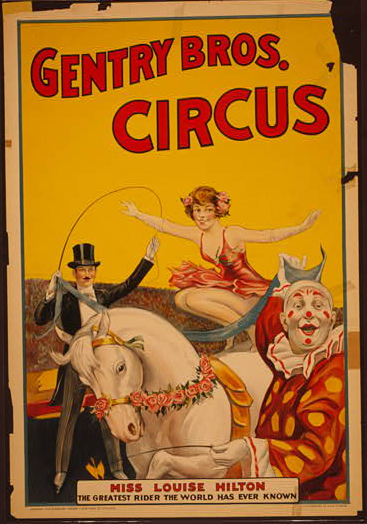 Summary: Circus poster showing Louise Hilton perched on a white horse, about to leap over a scarf held by a clown and a ringmaster. Medium: 1 print (poster) : silkscreen, color. 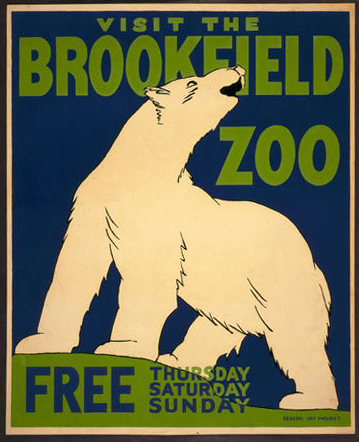 Summary: Poster for the Brookfield Zoo announcing days when entrance to the Zoo is free, showing a polar bear. Title: Visit the Brookfield Zoo by the "L" / Gregg. Medium: 1 print on board (poster) : silkscreen, color. Date stamped on verso: Jun 15 1938. 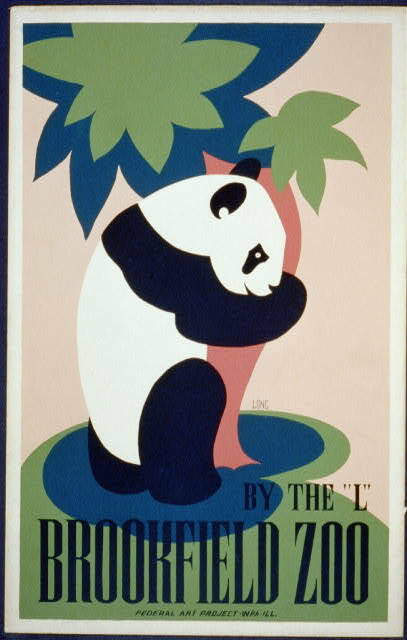 Work Projects Administration Poster Collection (Library of Congress). Promotional goal: U.S. K5. 1938. Medium: 1 print (poster) : chromolithograph. Copyright by the Strobridge Litho. Co., Cincinnati & New York. Medium: 1 print (poster) : color. 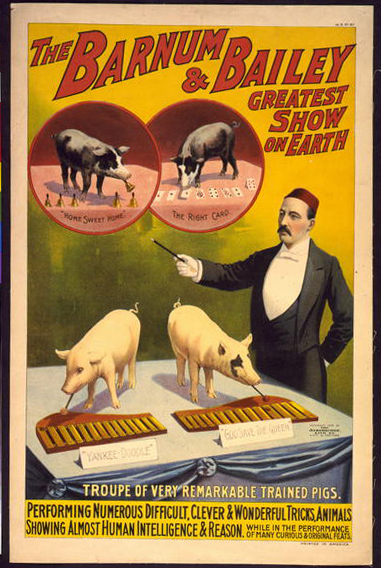 Summary: Pigs playing xylophones, bells, doing card trick, and their trainer. Copyright by Strobridge Lith. Co., Cincinnati. 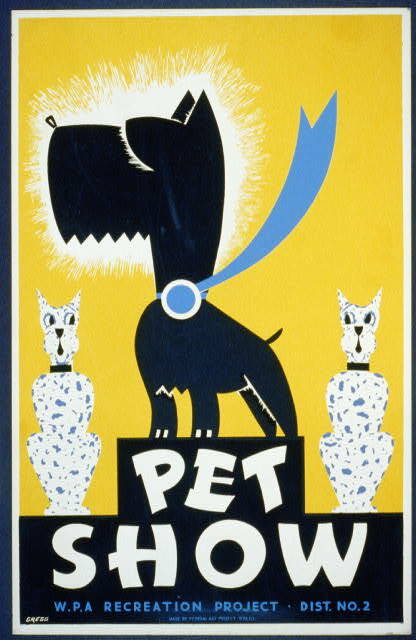 Title: Pet show WPA recreation project, Dist. No. 2 / / Gregg. Summary: Poster showing a dog wearing a blue ribbon, flanked by cats. Date stamped on verso: Apr 3 1939. Title: Brookfield Zoo--By the "L" / Long. 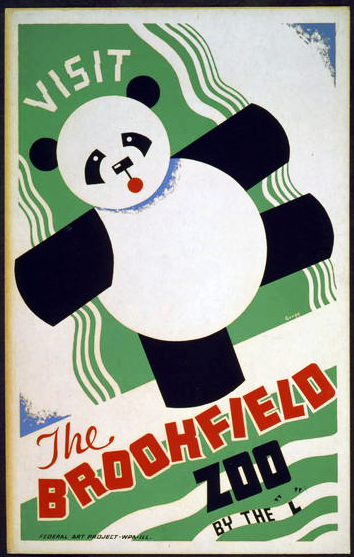 Summary: Poster showing a panda bear hugging a tree. 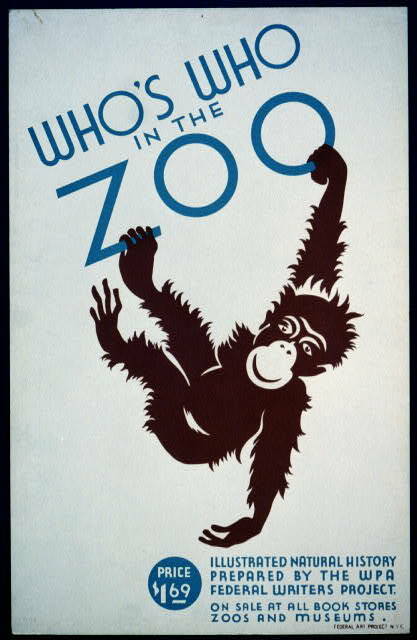 Title: Who's who in the zoo Illustrated natural history prepared by the WPA Federal Writers Project : On sale at all book stores, zoos, and museums. Summary: Poster advertising WPA Federal Writers' Project illustrated guide to natural history. Date stamped on verso: Jun 4 1937. Date Created/Published: Boston : The Forbes Co., c1890. Medium: 1 print (poster) : lithograph, color ; 51 x 60 cm. 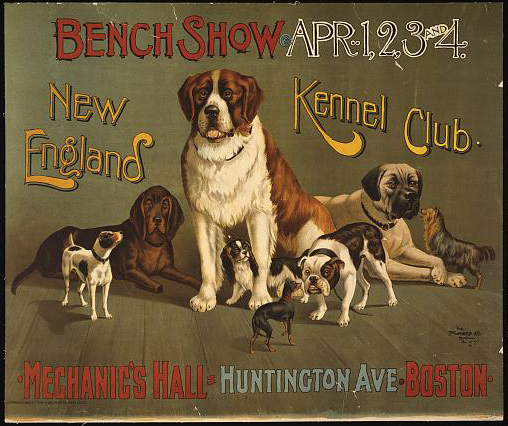 Summary: Poster showing a variety of dogs at the New England Kennel Club's dog show. Mechanic's Hall, Huntington Ave., Boston. Title: Chicago Kennel Club's dog show / Geo. Ford Morris 02. Date Created/Published: [S.l. : s.n., 19]02. Medium: 1 print (poster) : lithograph, color ; 56 x 35 cm. 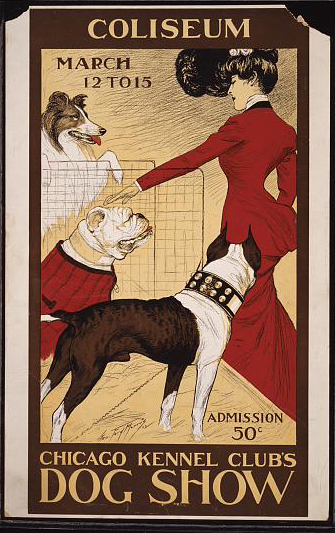 Summary: Poster showing a woman admiring dogs at the Chicago Kennel Club's dog show. From caption card: Lithograph and letterpress by George Ford Morris. Title: Mascoutah Kennel Club dog show. Dogs from both continents / Geo. Ford Morris 01. Date Created/Published: [United States : s.n., 19]01. Medium: 1 print (poster) : lithograph, color ; 53 x 32 cm. 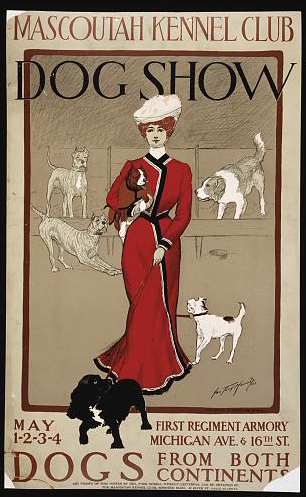 Summary: Poster showing a woman with dogs at the Mascoutah Kennel Club's dog show. 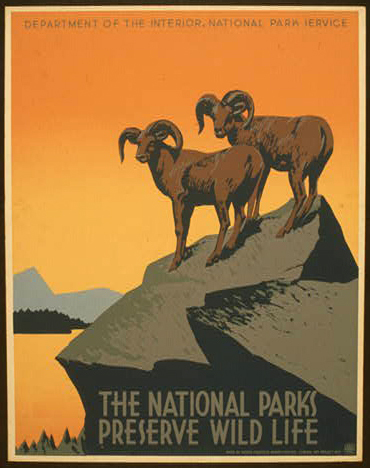 Summary: Poster for National Park Service promoting travel to national parks, showing two bighorn sheep. Date stamped on verso: Aug 23 1939. Poster designed by J. Hirt. Exhibited: "Capitol Visitor's Center" at the U.S. Capitol, Washington, D.C., 2009-2010. Medium: 1 print on board (poster) : woodblock, color. 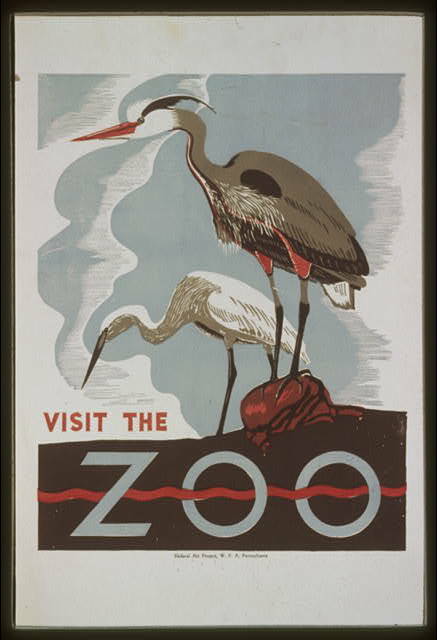 Summary: Poster promoting the zoo as a place to visit, showing two herons. Promotional goal: U.S. K5. 1936-1941. 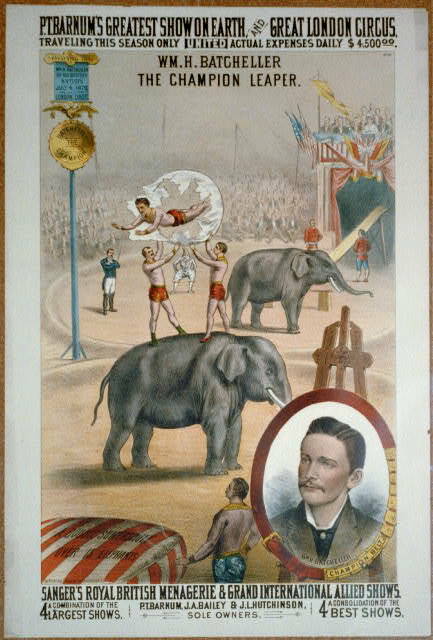 Summary: Circus poster showing Wm. H. Batcheller, "The champion leaper" jumping through a hoop over an elephant; also shows head-and-shoulder portrait of Batcheller, facing left, on easel in lower right corner. Caption continues: Traveling this season only united ; Actual expenses daily $4,500.00 ; A combination of the 4 largest shows ; A consolidation of the 4 best shows ; P.T. Barnum, J.A. Bailey & J.L. Hutchinson, sole owners. Medium: 1 print (poster) : lithograph, color. 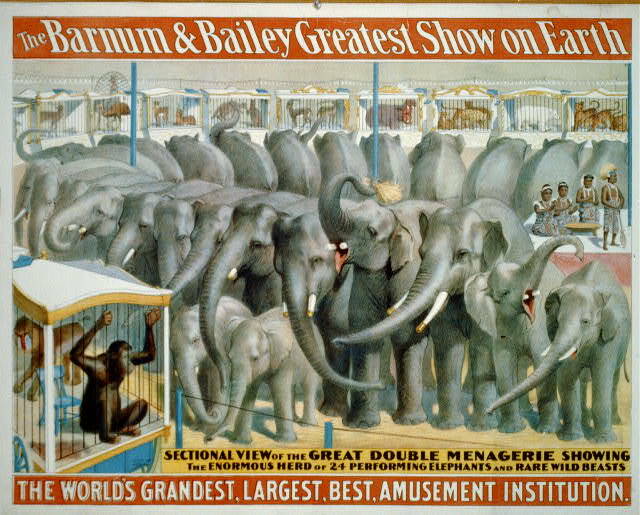 Summary: Poster showing elephants and animals in cages. Copyright by the Strobridge Lith. Co.
Caption reads: Sectional view of the great double menagerie showing the enormous herd of 24 performing elephants and rare wild beasts. 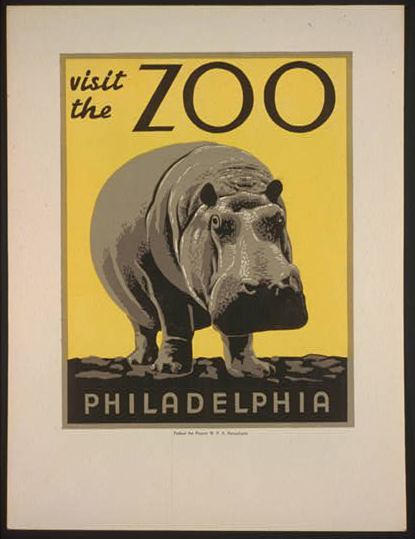 Summary: Poster promoting the zoo as a place to visit, showing a hippopotamus.